Fruit and vegetable juice contains a large amount of water, sugar, malic acid, citric acid, tartaric acid, etc. Fruit juice also contains a small amount of tannin and protein. Minerals are mainly calcium, phosphorus, potassium, sodium, etc. The pigments include carotenoids, anthocyanins and so on. The juice also contains a small amount of heat sensitive substances and aromatic substances. 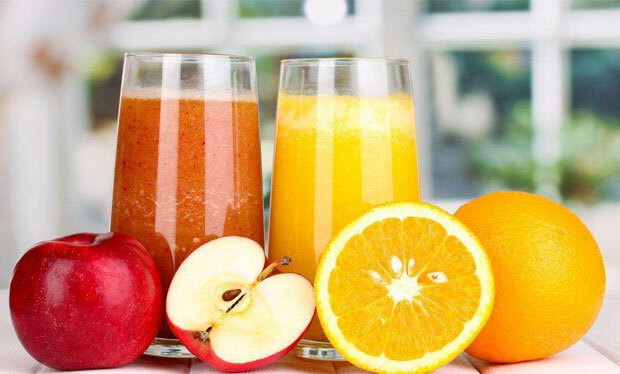 Only fully grasp the composition and characteristics of fruit and vegetable juice, can you flexibly use various techniques in juice processing production process. In order to obtain the ultimate quality products of the original juice to the maximum, you can intervene the link that destroys the original nutrition, color, flavor, and aroma of the juice. The juice is generally divided into clear juice and turbid juice. Common clear juice includes pineapple juice, grape juice, watermelon juice, blueberry juice, blackberry juice, etc. Turbid juice has orange juice, tomato juice, carrot juice, etc. Fruit juice with flesh usually includes peach, apricot, plum, plum, etc. 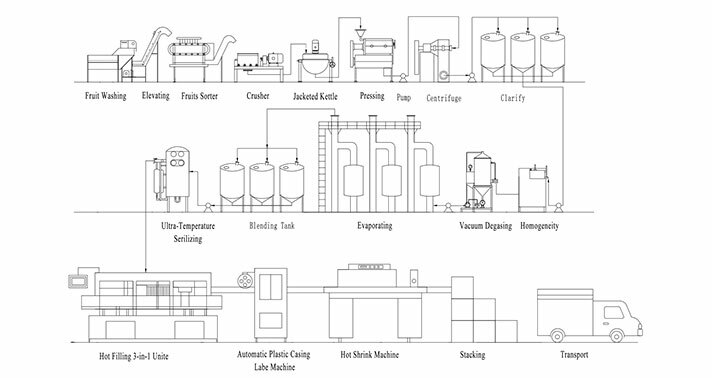 Process flow of fruit juice processing: pretreatment (selection, cleaning, crushing, heat treatment)- juicing- coarse filtration- ingredient adjustment- fine filtration- homogeneous degassing- concentration- sterilization- filling. In the process of pretreatment, it is important to use dilute hydrochloric acid or fatty acid for washing the fruits and vegetables with more pesticide residues. After crushing and before squeezing, preheating treatment is mostly needed. The purpose is to soften the tissue of the flesh and improve the yield of the juice. In addition, different preheating temperatures can promote or inhibit enzyme activity. According to the properties of enzyme, proper pH value, temperature and action time will directly affect the color and flavor of the final product. Therefore, according to different market demands, we must grasp the different processing technologies. There are several methods to clarify fruit juice, such as enzyme gelatin method, gelatin tannin method, enzyme method, indigenous diatom, etc. It is worth noting that, when the enzyme method is used, the pH value of the general pectinase is 4.5-5, and the temperature is 50 ℃. If it is grape juice processing, special tartar removal is also needed. The mixing of fruit juice, that is, the process of blending. It includes the adjustment of sugar, the determination of the ratio of solid acid, the addition of vitamin C and so on. To make the final product reach a certain specification is a decisive step for the nutrition, taste and color of the final product. When producing cloudy juice, it is necessary to homogenize the juice to prevent the separation and delamination of solid and liquid, so as to promote the taste more delicate. In order to prevent the fruit juice from oxidizing and deteriorating, it is necessary to degas the juice to remove a large amount of oxygen, carbon dioxide and nitrogen mixed in the pretreatment process. Generally, the juice concentrate is made by falling film concentration, and it needs to be concentrated rapidly and efficiently at low temperature and in a vacuum state. In the case of ensuring that these conditions are reached, realizing maximum energy saving and lower production cost. In the process of concentration, it is usually necessary to recycle the aroma. The aroma recovery rate of the apple juice is 8% to 10%, and the grape juice and orange juice are from 26% to 30%. Most of the clarified fruit juice is filled with hot filling. After filling, the fruit juice is pasteurization. 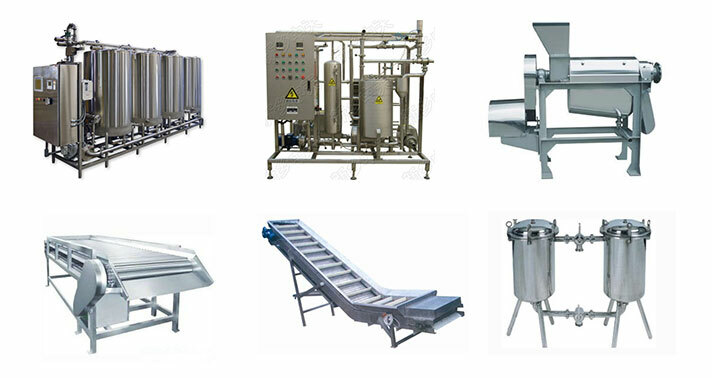 Generally, high temperature and short time sterilization is used for cloudy fruit juice. The integration of domestic and foreign advanced production technology, combined with the characteristics of customer’s specific investment, the best process plan for the whole plant of fruit juice production line is formed. It can be designed according to the customer’s own enterprise status, investment concept and market reality. We provide a real turn-key project for our customers. We are committed to developing and innovating technology to improve the overall efficiency of the equipment, reduce the downtime caused by maintenance, greatly reduce the cost of customers, and invest once in a lifetime. What are the types of fruit (apple) processing? How to choose fruit juice or juice drink?